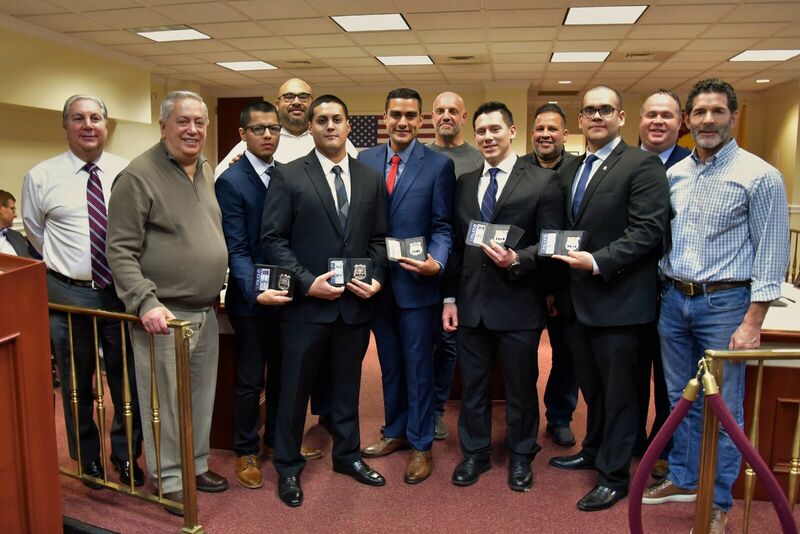 On January 4, five new police officers were sworn into the North Bergen Police Department. Christopher Arce, Erick Rodriguez, Jorge Palaguachi, Julio Noriega, and Mayo Diaz took their oaths at Borough Hall. They will be headed to Bergen County Police Academy later in January. Prior to being appointed, some of the officers held positions as dispatch specialists for the town or as corrections officers, according to Deputy Chief Peter Fasilis. All five of the new hires are North Bergen residents, in accordance with the residents-only hiring policy the department has continued since its inception in 1976. The policy is widely supported by the police and the public. Some departments in the state do have residency preferences or short-term residency requirements. While residents-only policies are often seen in larger metropolitan cities, they’re very rarely practiced in towns with populations comparable to that of North Bergen. According to Public Safety Commissioner Allen Pascual, North Bergen’s police force is becoming more representative of the township as more hires join the department’s ranks. According to the 2010 Census, North Bergen’s residents are 68 percent Hispanic or Latino. Fasilis said the residents-only policy expedites a number of police practices. The policy also helps police brass to vet new prospects.